Pascal Zamprelli reports from Voices from the Quiet Revolution, a half-day conference held at the he McCord Museum which aimed to shed light on some of the myths associated with Quebec's Quiet Revolution. Bernard was addressing an audience gathered at the McCord Museum for Voices from the Quiet Revolution, a half-day conference which aimed to shed light on some of the myths associated with the Quiet Revolution by going straight to the source: some of the pivotal actors who played a part in it, including Bernard, as well as Guy Rocher, Claude Castonguay, Bernard Landry, Gregory Baum and Françoise Sullivan. Organized by McGill’s Quebec Studies Program and the Institute for the Study of Canada, the event took place on Nov. 10, 50 years to the day newly elected Premier Jean Lesage delivered his inaugural speech in the National Assembly, in which he spoke of “broaden[ing] the government’s field of action,” and “moderniz[ing] and reshap[ing]” much of Quebec society. Thus began a period unlike any other in Quebec’s history. Over the next dizzying decade, the province would embark on a course of major reforms in almost every area that matters: Quebec’s role in Canada, the Church’s role in Quebec, education, health, economic management, and natural resources, to name few. 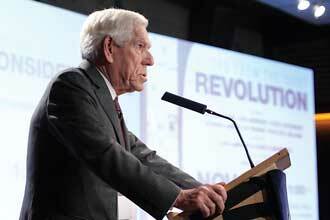 “Fifty years later it is easy to see that the Quiet Revolution based on a strong urge of Quebecers to be responsible for themselves, to set their own agenda, to make their own decisions in all spheres of life: social, religious, cultural, economic and political,” Bernard said. That is not to say that the generally accepted notion that the Quiet Revolution was directly linked to the rise of the sovereignty movement is so clear-cut, or even true at all. “Such an active policy was fully compatible with Canadian federalism and was in no way tainted with any kind of separatist ideology,” Bernard said. Castonguay agreed, adding that the progressive ideas emanating from Quebec were at first very well-received by elected representatives and bureaucrats elsewhere. He explained that when he and Lesage described their idea for a new pension plan for Quebec to their federal counterparts, “the reaction to our plan was so positive that Pearson, who had a good sense of humour, asked if they could join it,” he said. Pearson went ahead instead with a different approach nationally, but when the two sides couldn’t square their plans, they simply agreed there would be two plans. “The agreement, was seen as a major step or victory in the concept of cooperative federalism, said Castonguay, who went on to create the Caisse de dépôt et placement du Québec, further solidifying the role of government, as opposed to private interests or the Church, in choosing Quebec’s social direction. Along with the QPP, the Caisse, and Quebec’s role in Canada, education reform stands out as a deep, lasting legacy of the period: Quebec saw the creation of a Ministry of Education, which wrested control of education from the Church and created a single authority for the Protestant and Catholic systems, the creation of the CÉGEP system, public universities, and a consequent evening out of the playing field in terms of accessibility to education. All these changes may seem like they were part of a master plan, but such was not the case. People sensed things needed to change, and it took bold leadership and many to accomplish these changes, but it seems the Revolution led them as much as they led it.